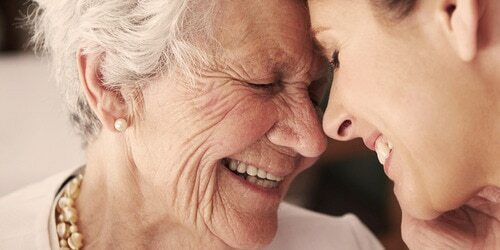 Dementia and incontinence: how to care for your loved one. If your elderly loved one develops dementia, they might be different from the person you knew. And now, more than ever, they need your love, care and understanding especially if they are incontinent. Something to prepare yourself for if your loved one has dementia: they might not know when they need to go to the toilet. They might start having accidents, wetting or soiling themselves. Incontinence is a common side effect of dementia and, as other caregivers have noticed, it will require a lot of patience to provide the best possible care. Below, and on the following pages, you can learn some information about caring for someone who has dementia and incontinence. This will help you to keep your loved one clean and comfortable. Someone with dementia might not understand why they need to wear anything other than their regular clothing and underwear. Depending on your loved one’s condition, you might have to explain exactly why you’d like them to wear incontinence pads or pants. To help your loved one feel at ease, try to make the switch to using these products a part of their usual routine. In addition to using protective products, it would also be helpful to protect beds, chairs, and other furniture. This will simplify your daily cleaning and help to keep your loved one’s environment fresh and clean. For more information, explore our TENA incontinence product range and our hygiene accessories. When a person becomes incontinent, they normally need to change their clothes more frequently. However, if they also suffer from dementia, it can be extra challenging and they might need more assistance. In order to make things easier for both you and your loved one, try to make sure their clothing is easy to change. Clothes with zippers and Velcro are simpler to manage than fiddly buttons and snaps. If you’re able to make the changing process easier, your loved one is likely to feel less anxious or embarrassed. Especially if they can dress or undress themselves with less assistance. You might find that changing your loved ones diet could improve their general well-being. A warning though: they might resist such changes, especially if, due to dementia, they’ve developed a dislike of, or liking for, particular foods. To make sure they eat a balanced diet, it’s good to discuss any changes with their doctor or a dietician. It’s also important to make sure your loved one is staying hydrated. So try to keep an eye on their fluid intake to ensure that it’s consistent. To further improve your loved one’s comfort, try installing a portable toilet chair/commode to the room(s) where they spend most of their time. This helps if a person has problems making it to the toilet in time especially at night. You might need to explain to him or her, though, why you’re doing this. It’s important to consider your loved one’s feelings and talk through your proposed changes with them, as they might be sensitive to them. Your doctor may prescribe medication that treats the bladder’s urge to urinate. Or one that changes how often the bladder tells the body that urination is about to occur. These medications generally reduce frequent urges to urinate when your loved one is unable to make it to a toilet fast enough. These medications could have side effects like constipation and dry mouth. Make sure to get information about side effects in order to follow up on the medications effect and side effect. Hygiene is important – particularly if your loved one is incontinent. With dementia, he or she might neglect to wash themselves and it could require more assistance and as well more patience from your side. > Get more, helpful hygiene tips here. Helping your loved one with their hygiene.